An eventful day in many respects. Heavy rain showers passed overhead during the night but I am up to another fine morning and then a descent off the high plateau in good weather. Klimpfjall is a few hours away and the descent from 'kalfjall' takes a number of easy miles. I pass the Sami couples encampment, some distance mind but I can see that they are up and about. The man is out in the lake fishing, smoke rises from their fire. A dual purpose perhaps of smoking fish and warding off the voracious mosquitoes who are thriving in this weather. Their camp looks serene though. I am thinking of food too. Grona Bandet lore has the 'Fjallgard' and it's Italian restaurant as a good place to refuel. I reckon I should make it by lunchtime and this motivation has me move with purpose. The pack's a few day's lighter and the going's good. Dry fell and hard ground though it becomes wetter and boggier as I move down. There's interest on the way. I meet a local whose been out camping with her dog. She told me that she had to move from here summer tent (it leaks apparently!) in the night and found an old turf kata to shelter in. Thunder and the fear of lightening drove her under it's ancient structure. The kata is one of the many residual buildings of a Sami community. More are found further down. There's a pictorial guide and I stare at photographs of Sami children from decades ago. Once the site of a Sami school I learn, children spent months here away from hearth and home. I reflect on that a little as I pass through a contemporary Sami community before hitting the highway. Snowmobiles and decent cars parked outside well maintained houses speak of a more prosperous north perhaps. By 11.30 I am in Klimpfjall. I spy a supermarket which could have meant carrying a lighter load over the past days. Never mind, I'll console myself with lunch. I'm through the door of the Fjallgard and I enjoy several large plates of carbonara and salad washed down with gallons of coffee. A little self conscious perhaps in my stinking hill clothes but I enjoy an excellent lunch. The afternoon's walking is as good as the food. A freshly marked trail leads me out of town and up towards Durrenstugan. The landscape holds plenty of interest, fells with steep cliffs and sharp features. The terrain's forgiving too and in pleasant weather I make good progress despite the glut of food consumed some hours before. It's good to be here. Norwegian Borgefjell rises to the west. The east holds the promise of Marsfjallen. I'll be back one day for both. Mid-afternoon and I arrive at the Lansstrylesen hut of Durrenstugan. As before it's an open and unmanned hut, subject to an honesty fee of 100kr. I sit down for a minute and the flick through a copy of Ute magazine from 1994. That doesn't really seem so long ago but the gear worn by people in the mag seems from another planet. The features though seem pretty constant, I spend 10 minutes reading an account of a Sarek trip. One undertaken 20 years ago, the gear's different but Sarek looks the same. I stir myself though and off I head. In poor weather I would have spent the night here. The hut's in a great position, by the side of a high lake flanked by fells. Before long though I feel the urge to pack it in for the days. Coming off trail a little (and I am later glad that I did) I camp on a flat grassy pitch not far from a stream. It's hot and I revel in the coldness of the water. The intention is an early night. Around 10.30 though I am stirred by the sound of petrol engines. Two off road bikes whizz down the trail. Samis are herding reindeer, I look out and see hered being driven off the high fells by a helicopter that's now audible. The reindeer, to escape the hear of the day, have scattered on the high ground and as the day cools their owners want then down. A medley of petrol engines for an hour and then the ground reverberates. Hundreds of reindeer stream past my tent and then settle not so far away to graze by the side of a tarn. I hear the helicopter land up high and get up to take a look. High above Vastra Fjallfallet the helicopter perches itself. The pilot and his companion have climbed out. Cries ring out in the night sky. Their shouts, quite literally are of joy! And why not. It's a little after midnight on a perfect summer's night and light still fills the sky. It's the stuff of life itself. Voices of celebration. I climb back into my sleeping back and settle down. Reindeer grunt to each other by the tarn as I drift asleep. Perfect. It was good to hear from Annica of ATI Mountain Experience, the driving force behind the Grona Bandet. Annica told me that the website has parallel English pages now. All the details as to the challenge and how to conduct an attempt can be read in English. That's good to see. It will no doubt broaden it's appeal outside of Sweden, and rightly so. The pages have also been freshened up a little. The link is here so have a look. 2014 looks a busy year for both seasons of the challenge. The first 'Vita Bandet' has gone off and there's a fairly full blog here as they pass through Harjedalen and into Jamtland. Summer looks busy too with another running attempt and some international challengers from Germany and Finland. A day that began in thick brush and forest in northern Jamtland finishes in wide open fells in southern Lappland. The sun's constant though. It's also a day when a little kindness puts a spring in my step. I'm up at the regulation time to breakfast again in the protection of the hut. The weather's good and the mosquitoes are loving it. A few weeks left of intense activity remain. My wrists bear the principal scars of living exposed to thousands of biting insects. A few ugly welts and scars pepper my arms. Under the watch strap seems favourite. A wet and boggy 10 kilometers down to Raukaselet. It's hard going. Bush everywhere (the video below gives a taster) before I'm descending on wet ground to Raukaselet, a collection of huts by the broad lake of Raukasjon. Here a tarmac track offers a little respite as I switch direction and head towards a number of buildings at Raukasjo. There's quite a contrast here. In places it's apparent that some buildings are suffering neglect. There are signs of construction as I walk towards the 'fjallgard' at Raukasjo (see here). It's a well kept collection of tourist cabins. I spy a man busily painting one of them as I walk towards the start of the trail. I near a little wary and ask him where the path starts up the fell. We quickly fall into conversation. Tommy is the owner of the fjallgard and he tells me a little about the place. Principally this impressive collection of huts are his own work. He has even put in the road and a mobile phone mast. I warm to him and am initially surprised that he knows about the Grona Bandet. He asks me if I would like a coke to take with me, music to my ears. He rushes inside and comes out with several bars of chocolate and two cans of coke. I am incredibly grateful to him. I later remember that Tommy has 'form'. Lars Wessell's blog describes how Tommy equally gifted him with food. Lars told me a Vitabandet participant had the same reception. As much as the gift itself it's the act of kindness that lifts me. Combined with the sugar and caffeine of the coke I am up the hill without too much bother. I'm delighted to clear the forest and find myself up onto wide 'kalfjall'. It feels good. As Sjlipjehke swings into view I realise I am about to leave Jamtland and cross into Lappland. A significant boundary, I feel both excited and a little regretful that one stage of my journey is over. But before the day is done an opportunity to nose around Slipsikstugan. These are huts run by the county authority. Two principal huts, mainly for reindeer herding but walkers are free to use subject to paying 100kr (£9) on an honesty basis. In return, a roof, a bed and a fire with wood. I look first into a 'modern' hut which is in a state of renovation. It feels rather damp, inside a little sordid. More appealing is the old hut. I crouch in through a low doorway and walk in. Four bunks against the wall and a charming wood burner. I can shake a sense of intruding though. A bed is made up with a bible on the table. It's doubtful anyone is in residence but somewhat respectfully I leave! I find a spot to camp about 500 metres up from the trail. The position is good and I enjoy simple lying in a stream and feeling the sweat flood off. Smoke rises from a small wooden kata some distance across the lake. Tommy told me off an old Sami pair who are camping on the fell. A summer of fishing and simply being out. No doubt the fire wards off the mosquitoes that are plaguing me! Looking back at the pictures of this day I am struck by the intensity of the blue sky. The weather had been building to this since I had left Gaddede. Waking up at my high camp above Sipmesjaalhte the promise of a hot day was also to inform my route choice. My original route plan was to see me heading to Sielkenjakkstugan and then via Harbergsdalen before north across Borgafjallen. My destination Raukasjo before a single high fells trail into Lapland. The alternative was a shorter route to Raukajo via Ankarede. Wetter ground was promised by the map but it looked half a day shorter. As I packed up that morning in dazzling sun I persuaded myself that half a day saved was all to the good. Putting myself onto the westerly route around Ovredahke was easy enough. As I descended off the fell the Sami huts at Sielken provided a reference point. Another quiet Sami settlement passed through, again barking dogs marked my progress. Then a climb onto Rodfjallstugan, heaving myself and my still heavy pack in hot sun. But the view's certainly worth it. Wild campsites abound up here with flat pitches next to sparkling tarns. I arrive at the rest hut of Rodfjallstugan around 11.30 am and commence my customary inspection. I note the boys from Le Trek spent the night here. Again their visit 10 days before was in markedly cooler conditions. I spend a few minutes collecting myself. A wooden bench outside besides a fire pit offers a few minutes respite before a sense of making progress stirs me. I'm rather drawn to this place mind. A high location, lightly wooded and commanding views. It's a good trail down to Ankarede. Well marked and duck boarded in places. I bump into my first walkers since Jamtland to my surprise. Arguably they don't count! Locals out on a 'fisketur'. It makes me think how quiet these hills and trail network is. Quiet a difference to popular northern Lappland but equal certainly. I'll be back here on day. Linking this area up with neighbouring Norwegian Borgafjell offers plenty of options. Ankarede is interesting (more here). A large collection of wooden Sami 'kata' become apparent as I cross Lejaralven. What's before me is a key part of Sami culture in the region. A village around a large wooden chapel marking how western civilisation and Christianity established itself in the north. Today though it's fairly quiet but it serves as a launching place for a well marked trail to the stunning waterfalls at Lejarfallet. And here is the highlight of the day, undoubtedly. Over the broad fall tumble gallons of white water. Quite a contrast against an azure northern sky. I sit for a while (after emerging from the bush and spooking a family) picking at some dried fruit. It's a glorious day no doubt but walking in hot weather brings it's own challenges. The heat and worsening condition of the trail conspire to bring an afternoon of toil. Cross hatching on the map indicates marshland and I am right in it! Ski posts mark the way in the main and they conceal themselves in vegetation and bush. It's a rough ten kilometres up from the falls and towards the rest hut at Tjarnbacken. I've had enough when I get there. Normally I don't like to camp around 'vindskydder' but today the remoteness of the location and heat of the day settle it. The tent goes up and I look around. The facilities though seem fairly luxurious. The main hut provides a room to sit in and eat out of the reach of the gangs of insects buzzing around. a second hut has a sit down toilet, loo paper and a large bin for my rubbish. I begin to settle in and the familiar routine of washing and eating occupies my evening. I flick through the hut book. There are some amusing comments, some equaled by the graffitti on the hut wall (including one by someone who exhorts care and consideration of the wilderness but has no issue with defacing buildings). What's clear is how infrequent visitors are here. I spend a quiet night consequently. Bed follows in bright sunshine a little after ten. Two and a bit years ago I shoved my Neo Air into my crammed gear cupboard and forgot about it. It gently deflated overnight a few times and I promised to myself I would investigate it and never did. Coming across it recently I thought it might do for my son (we are all off to Jamtland this summer) so resolved to do something about it. I emailed Thermarest (Cascade Designs) in Ireland last week. They said send it over and we will have a look. Under a week later a package arrives. A brand new Neo Air Xlite, apparently warmer and lighter. I'm pleased! Looks like the assertion of a lifetime guarantee has substance to it, a no fuss replacement. Delighted. For the kids as well (cough, I may use them too) some inflatable air pillows by Mammut. Brand new on ebay at £8 each and they have been positively reviewed by *PTC. Just need to go backpacking now! Luckily that's coming. Up to the Highlands in March and April, heavy dump of snow in the last week so it should be interesting. Can't wait. After an easy pack up I head north west up through a birch forest. The ground's wet and within a few minutes of leaving camp I'm sweating. The intention is to pick the main trail up, that's achieved fairly shortly as I spy the familiar red cross of the ski trail. It's a fine morning, the start of a very settled and warm period that's to last almost to Hemavan. Pleasant in it's way but the heat brings it's own challenges. Insects are at the peak of their life cycle and I have quite a few to deal with in the days ahead. Within a couple of hours a descent to the Sami winter village of Vaktarmon. Reindeer are everywhere, so are the tools of reindeer husbandry. Coils of fencing wire and a hut in the shadow of the cliffs of Aavaartoe before the trail heads through the reindeer corals around Vaktarmoen. The village is mainly deserted (where do the Sami go in the summer?) but dogs warily eye my progress from one hut. Another ascent follows. A broad plateau as I head towards the hut as Balkesbourke, the toil is rewarded by the beauty of the place. Tarns shine in the bright sun and then the kilometre long Snjaotjanjaevrei. Wild camp site after wild camp site here, it's only early afternoon so I have to pass by. Alluring possibilities of high sites next to sparkling water. The 'vindskydd' of Balkesbourke appears on the horizon at around 4. I pop in and sit down for a moment. The guys from 'Le Trek' were the last visitors here, some ten days ago now. I'm to track their progress across into Lapland by flicking through the visitor books of the huts I visit. Interesting to note the differences in the weather we experienced in the same places. Mine is hot, too hot. Conversely, only under two weeks before they battled with persistent wet and cold. It's a moment of indecision. My intention, born of my sofa bound planning in England is to swing north east and head into the fells of Ovredahke. This area, quiet as it is, has a choice of trails heading north. The original route plan of heading to Raukasjo via Harbergsdalen holds for today at least. I decide to trim some of the distance of by heading cross country to the huts at Sielkentjakkstugan. A start is made from Balkesbourke, my navigational prompt the small rise of Sipmestjaalhte. By 5.30 and an hour or so of rough walking the familiar ache of 'enough'. I pitch in bright sunshine and survey my choices north. I begin to doubt my planned route. It looks longer than the trail via Ankarede. I'm at that point now in the walk where conserving effort feels like a priority. Something to worry over as I begin to prepare my evening meal. I've saved a few chores to the morning. The pack's mainly sorted but I am up at 7 to tidy up the hut. As is usual in Sweden you are expected to do your own cleaning, that's fine as in one corner there's an array of cleaning kit. A quick hoover and straighten up, some coffee and then I head over to the camp ground office to pay. Once again I've packed too much food in my supply box. No problem, one of the staff offers me 100 kr for a box of 'Food Doctor' bars. As we conclude 'settling up' she tells me the weather is forecasted as hot and sunny for the next week, the best of the summer she says. Hard to believe after yesterday's heavy rain, this morning is overcast but we will see. I'm sorry to leave. With advice to head over the dam wall out of town I save myself a couple of km. Down the highway and then it's a sharp left, up the road that climbs the fell and the town ski lift system two km up at Brattli. Two runners pass me on the way up. I'm struggling a bit, a ten day load on my back. Not funny. This is the bit I don't like, a fresh stage means a fresh load. But I have a lot to look forward too. Stage 3 is pure mountain (route here). Wide open fell all the way, across country I've never even contemplated traveling in before. Southern Lapland in a couple of days, empty walking country this as it's a bit of a journey to get here. No ease of rail connections such as Laponia or Jamtland. Consequently, I expect it to be quiet (it is). I still haven't seen any other walkers since I left the main Jamtland hiking area some weeks ago. Despite that there's a good trail network and the back up of some unmanned huts further north. A new Calazo in my hand (Kittlelfjall/Borgafjell), I feel I've shaken the grind of Stage 2 off now. I'm excited. At first there's a climb through birch forest. The weather improves as I spy the small rest hut of Guhkiesnes on the lip of a broad ridge. Some effort through the birch and I am there by mid-morning. Reindeer scatter and I approach the hut, in I go for a sit down and a nose around. It's the province of Gaddede's snow mobile club. In good nick and plenty of wood in the corner. It's a pleasant place to stop and rest. What a view through the window! A broad valley about ten km across and then the ridge of Jenklumpen rising beyond, the weather is improving too and the pack doesn't seem quite so heavy as I set off. A descent at first, the trail fairly well marked with ski posts showing the way. The going gets much wetter as I head down towards Holmsjon, it's 'cross-hatched' on the map so shouldn't be too much of a surprise. I have to work though. At the corner of Holmsjon I make an error, instead of a swing to the right I follow a more minor footpath north (I later learn I am not the first to do this, Lars Wessell made the same mistake coming this way). Within 45 minutes I realise the error of my way. I correct myself and start to head towards Dodmansstjarn ('Dead Man's Tarn'! ), in theory the main path should be relatively easy to pick up after that. A little tangle of bush and mire around the lake of Bleriken. Two rough wind shelters are found and passed. This area probably gets some passing trade in the winter months. This is snow mobile country, an easy ride from Gaddede would put you here in a few hours. But for today it's just me. In warm sunshine I pitch the tent at five and decide on an early night. An evening in a familiar routine, towards the west Norway's mountains occupy my gaze. I'm fast asleep at 8.30, not before one last glance at the map. Much to look forward to! I am getting on quite well with My Tikka RXP. I posted in December, since then it's had some good use on early morning runs. It lasts well for the 2 hours plus duration but I am aware it has a battery limit of around 3 hours on full power. This is it's major drawback I think. I do like though the reactive lighting, I'm finding it useful. Trail Magazine reviewed it and it fared well. Worth a read here. Some interesting comments on my own post too, not all positive (see here). Sweden's mountains ('fjallen') rise from the deep boreal forests of Dalarna and run without pause for a 1000 miles to the lonely northern border stone of Treriksroset. For the main it's unblemished wilderness though man's presence is marked, not least as these mountains are the home and work place of the Sami. There is arguably a center piece in this array of riches. For many one place that perhaps stands a little taller (with the greatest concentration of peaks over 2000 metres), a little more demanding (no real huts or refuges and a commitment of a week to cross) and a little harder to move through (no marked trails, glacial moraine and the toil of the Rapa Valley). Complete with a large concentration of the big boreal beasts (the Rapadalen is a redoubt for elk, bear and the wolverine) and you've a recipe for a memorable northern adventure. Sarek, the centerpiece of Laponia, is seen by many as the heart of Sweden's wilderness, if not the whole of Scandinavian Lapland. Whether that's true or not is a matter for debate. Other parts of fjallen boast equally high mountains (Abisko and Kebnaikaise region), feel as remote if not remoter (Arjeplog Fjallen or Nasafjallen) or are home to more flora and fauna (Rogen, Tofsingdalen or Vindelfjallen). Norway and Finland could each claim their own wilderness areas. What's for certain is that Sarek, to many, is the finest mountain area in the whole of Sweden, if not Scandinavia. Consequently, it's reasonably popular. People graduate to Sarek after gaining experience elsewhere. In the core month of August you'll be likely to meet others, particularly around the 'cross-roads' of Mikkastugan where most tours converge due to Sarek's geography. But equally there are plenty of side routes and valleys which see few people. Sarek's status as an experienced hiker's 'must-do' is deserved, a combination of superlative scenario and a landscape and weather patterns that require solid back country experience. It has a reputation for tough and hugely rewarding hikes that see scores annually traverse it's deep glacial troughs and come back time and time again to explore it's compelling and lonely recesses. Sarek is also surprisingly well served by transport connections so getting to the start of your walk shouldn't be too painful. In the main that's the legacy of infrastructure put in to serve the hydroelectric scheme at Stora Sjofallet. But even with that a Sarek trip requires a day or two minimum to pass through the surrounding wildernesses that frame Sarek. You need to earn your passage over the park boundary. Consequently a bit of time is a must to string together a route, I would say 10 days is the minimum for a trip through the park and surrounding areas, though a week could serve as a taster. But when something is so good why rush? One of the pleasures of Sarek is simply pitching the tent and just taking it all in. Equally, a bit of slack in a schedule is a good idea. Sarek has a reputation for it's weather, on average one day out of every three will see some form of precipitation. Sarek sits above the Arctic circle and is not too far from the Atlantic which serves up deep depressions (the park's shape can exaggerate storms, some western valleys, such as Routasvagge channel weather systems and can offer more testing conditions than other parts of the park). It's common to have to deal with some pretty grim weather (no worse though than a tasty day in the Scottish Highlands) and a spare day or two to sit a storm out in your tent can be an idea. But Sarek shouldn't been treated as a destination in isolation. It's a single component of wilderness designated as a world heritage site by UNESCO. Laponia (click here for map) is an expansive area of national parks and nature reserves that seek to preserve the landscape as much as for it's beauty as for it's part in Sami culture. Sarek is ringed by other national parks and other 'unprotected' wilderness, a Sarek tour should be treated as an opportunity to cross into other areas such as Padjelanta. The contrast between, say Padjelanta and Sarek, is marked and the two together provide different tastes and textures in a single trip. Alternatively, there's a chance to experience and utilise the world famous Kungsleden. It's a useful tool to make some quick miles and penetrate Sarek's eastern flank and the stunning Rapa valley (Rapadalen) or to aim for Sarek's south east corners via Parek. Equally, the trail of Padjelantaleden (map here) will spin you around Sarek's south and west offering numerous challenging and quiet routes in. And then if that's not enough for you Norway is not far, some of her mountains in the vicinity are of very different character and temperament. Just set your compass for the Nordkalotleden and it's southern terminus and you'll cross the border. If you packraft adventure then awaits across the huge Lake Virihaure and a chance to visit Norway's Rago National Park. Laponia offers Europe's largest area of protected land with a total of 5,700 square kilometres (2,200 sq mi). Opportunities for quiet wilderness walking are limitless. (A little more on Sweden's national parks here. More on the Kungsleden here and Padjelantaleden here. Roger Brown's site (here) is a good place to visit for info and a trip report on Padjelantaleden and Nordkalotleden). So what are the practicalities of a Sarek tour ('tur' in Swedish and Norwegian)? Firstly there's mapping. 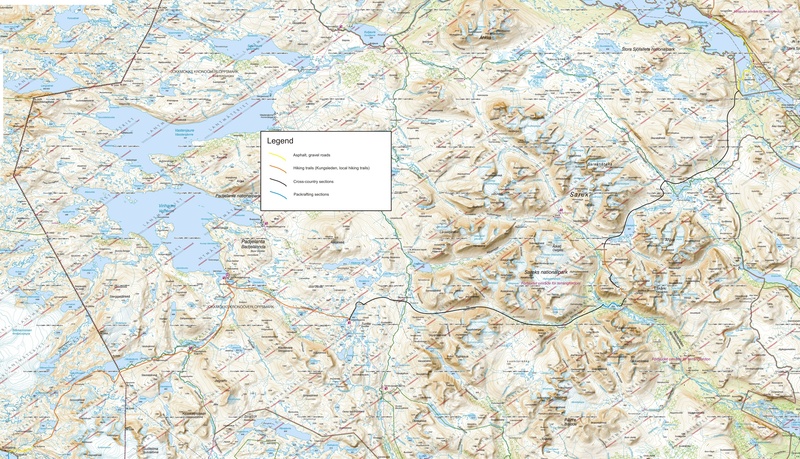 Lantmateriet's mountain maps ('Fjallkartor' (plural) in Swedish) are the 'ordnance survey' standard (my thoughts on them here) and BD9 and BD10 will cover you for the whole of Sarek, Padjelanta and through to the Norwegian border(have a look here for the mapping quality and idea as to routes). These are fairly easy to get in the UK via the excellent 'Mapshop'. Swedish mapping has been modernised somewhat by Calazo. The survey is the same but these maps are considerably lighter and tougher as these use tyvek. The bonus additionally is that both BD9 and BD10 are on a single map (it's double sided, coverage here) saving weight and cost. The price is good too at Kr150 (about £14.50). The bad news is that I haven't found them in the UK and have bought them only in Sweden. Arguably once the Lantmateriet maps are in a map case there's little difference but given the option I would go for a Calazo. These are on sale in most Swedish outdoor shops (eg Naturkompaniet in Stockholm) and could be picked up before the immediate start of a trip at STF Saltoluokta and STF Ritsem (both have a reasonable selection of outdoor gear, more below). Getting to and from the start and finish of your route will take a little time but shouldn't be too complicated or indeed expensive. One of the many positives of Scandinavia is a functioning and inexpensive public transport system. What's more it's 'interconnected' so you can get places without waiting around too much. Add to that some keen pricing on airline tickets to Scandinavia (book early mind) you can do a Sarek trip for well under £400 (assuming you plan in advance, snap tickets up when they become available and bring most of your own food from the UK (making the most of your baggage allowance)). Getting to Scandinavia is no hardship at all from the UK. I favour Norwegian (here), they've shaken things up in Scandinavia of late and you can get to Stockholm from £35 upwards. SAS and British Airways fly there too. If you come out via Norway (I think that makes sense if you are flying back to the UK), both Norwegian and SAS fly from Bodo to Oslo where you can connect back to the UK. Again book early, but that flight if booked early should be fairly reasonable (I've just checked and seven months in advance I've been quoted £130 Bodo-Gatwick). Alternatively, you can return via Sweden. Stockholm is the obvious way out, a train will get you there or you could connect via the northern airports of Lulea, Kiruna or Gallivare. But once you are in Sweden what determines where you go and how do you get there? I consider two elements determine a Sarek trip; the amount of time that you are prepared to invest in it and your entry and exit points. There are arguably five of these entry/exit points. Saltoluokta, Suorva and Ritsem are the first three. Lying to the north of Sarek these three points are served by the road to Gallivare, a consequence of the huge hydro-electric scheme at Storasjofallet (still controversial to this day but the infrastructure that serves hikers wouldn't be there without it). Suorva has the advantage of a 'dry' crossing of Akkajaurre whilst Ritsem demands a boat journey to Vaisa or Anonjalme to connect with Padjelantaleden and whatever way you might wish to enter Sarek (such as Kisuris, a favourite spot of mine). Saltoloukta means a boat journey across this same stretch of water from Kebnats (this should be your bus/car destination). 10 minutes in the STF boat (both water journeys from Ritsem or Kebnats are enjoyable, they'll set you back around Kr200 or £19 though) from Kebnats and you will head up the short trail to the STF lodge at Saltoloukta. Here, you've got the chance of a good lunch (the bus from Gallivare arrives approx 11 am, lunch 12pm) and use of the shop for any last minute needs or indeed fuel. I am very fond of Saltoloukta myself (see why here), the food is good and having a shop at your trail head which sells a decent selection of gear (from clothes to stoves to food to maps to fuel) can help. Suorva has the advantage of getting across Akkajarre by yourself, nearby is a shop selling food (expensively). Ritsem, at the western end, is another large STF complex. It's functional at best but the shop isn't bad (getting fuel can be hit and miss, I passed through in August 2013 and they were out of meths - there's a second chance though at the STF huts at Vaisa or Ahkka) and there is some food available. Once you are on the boat you've a chance of some coffee at least. The Sami cafe at Anonjalme is certainly worth a visit! Ritsem of course, as well as Kvikkjokk, offers the deluxe way to and from the borders of Sarek and the entry point of Staloloukta. 'Fiskflyg' (site here) run a shuttle service between Ritsem-Stalo-Kvikkjokk. A scheduled service ties in with the bus from Gallivare (see here for details in English). If you have the cash you can charter your own flight, there is though a fly ban over Sarek so you'll only get as far as the park border. Using a helicopter means you can get in and out to the Sami village of Staloloukta fairly quickly, covering a distance that took me around two days to walk in a mere 20 minutes. Kvikkjokk is served too by the helicopter (here). This small village, lying to the south-east of Sarek, is an important junction in Sweden's trail network. Kvikkjokk sees the beginning of Padjelantleden and is the halfway point of the Kungsleden (6-10 days in either direction will put you in Abisko or Hemavan). It's served by a road which connects to Jokkmokk (a significant Sami town) and from there the rail network at Murjek. Importantly, there are some good services here including the STF lodge (not a bad one, home to the 'Mosquito Veranda' from where you can sip one of their single malts). Getting to and from Ritsem/Suorva/Kebnats-Saltoloukta and Kvikkjokk is a combination of bus and train. By far the quickest way in is to Ritsem/Suorva/Kebnats-Saltoloukta with a sleeper train combination and bus. This sees a journey from say Stockholm on the sleeper to Gallivare. The bus will meet you here and after a couple of hours you'll be pulling up at Kebnats. If you heading to Suorva or Ritsem just stay on the bus a little longer. Bus details are here, however, I would advise booking your bus ticket when you book your train ticket. This is easily done on the SJ website (here) by selecting your ticket to cover the journey from Stockholm to Ritsem for example. The advantage of that is that if there is a problem SJ (the Swedish state railway) are legally bound to convey you to your destination as you booked from their website. This is useful, particularly, if returning from say Ritsem in order to meet the train to Stockholm in Gallivare. If there is a problem with the bus (say weather or breakdown) and you miss the train, it's SJ's job to get you back to Stockholm. Getting to and from Kvikkjokk takes much longer as you have to transit and wait in Jokkmokk for a connecting bus to and from Murjek. This once took me most of the day to travel from Kvikkjokk to the station at Murjek. It did give me an opportunity to seriously damage a Chinese restaurant's 'all-u-can-eat' buffet in Jokkmokk. If you are 'time-poor' you may have to discount Kvikkjokk as the Gallivare route is more efficient. Booking trains with SJ is easy online. The cheaper tickets tend to be released a couple of months before departure so play around with the site to work out when that might be. You've some options on the sleeper. I would ignore the seats and look at either the '6-berth' couchette or more agreeable (and expensive) '3-berth'. Prices should start at around Kr1000 or £95 including the bus. The big advantage is that the train's first stop out of Stockholm is Arlanda airport so you can skip the capital if you are flying there (which won't be the case if you choose Ryanair but that's your choice!). Swedish trains are good. Gallivare is reached at about 8.30 am, a distinct advantage say compared to Abisko (for the Kungsleden) which sees you grind out more hours on the train. I've mentioned Staloluokta as a connection point. If you are not using the helicopter then it's 'shank's pony'. Stalo' connects to Kvikkjokk and Ritsem of course via Padjelantaleden. The route that I will suggest below sees another 2/3 day walk to Norway and the village of Sulitjelma. Here you can pick up an either the school bus or the 9 am bus and get to Bodo (and it's airport) via Fauske (where you can also connect with the Norwegian rail network). This way out rewards you with another element to your trip (I think the Nordkalotleden via Sarjasjaure is a great walk). The downside is that it's a long day's travel back to the UK, there's a wait in Bodo for the flight to Oslo (but Bodo is pleasant and you can admire iconic Lofoten). I've always arrived in Sulitjelma the afternoon before. There's a good supermarket there so I have always had the chance to stock up (beer!) and pitch my tent in a small forest clearing just outside the village (perfectly legal in Norway). Two buses will get you to Fauske and then Bodo. Details here, you need to click on the PDF, page 147 shows details for 18-481 Bodø-Fauske-Sulitjelma (the bus passes through Sulitjelma, stand outside the supermarket on the main road - I favour the early 6.50 school bus). It's a good idea to have some Norwegian Kronor with you though I have paid in Swedish Kronor on the bus (its around Kr180, £17), you can get cash back at the supermarket. Perhaps confirm the bus in advance with the tourist office in Bodo who are very helpful. Once you've an idea of your entry exit points then you can plan your route. There are guidebooks in Swedish and German but none in English. To be honest I think an experienced eye on the relevant maps is all you need. It's worth looking around on-line as there are increasing English language blogs describing routes and tours. I'll suggest primarily my 2009 route (see the PDF here) as it chooses Salto' as my entry point and I exited at Stalo' and then headed for Sulitjelma. I've also more recently walked into Sarek via Routasvagge which offered a much easier route into the center of the park than across from Stalo/Pietsaure. Such a route into the center (ie the cross roads of Mikkastugan) is described here. Both these trips took around 9 days, I could have moved a little faster on both but both routes were challenging in different ways. Alternatively, this blog here gives an excellent account of a similar route (though with some key variation) from Sulitjelma to Suorva. Certainly worth a look and a great function here in respect of the mapping and routes. But there really are infinite options. Many routes are dictated by the large glacial troughs that separate Sarek's massifs and provide corridors into Sarek's heart (though of course if you're an alpinist then there's a dizzy array of route options outside of the valleys). To the west Sarvesvagge, Njoatsosvagge, Algavvage , Guophervagge and Ruohtesvagge. To the east following rivers westwards into the park, even with the possibility of a Sami boat at Sitojaure or Aktse. I've got my eye on the classic route up Rapadalen. This would mean a little time on the Kungsleden to get to Aktse and either chartering a Sami boat up the delta or the long hard hike though the bush before rising up into the center of the park itself. As my PDF mentions I was struck by Rapadalen when I walked the Kungsleden years ago. There is something about it and it's home to elks and bears. Additionally approaching Sarek from the south is another must do, a jaunt up the Kungsleden and then via Parek to the observatory at Parte. I've scratched around some of Sarek's valleys to the south on my 2012 summer trip and felt a real sense of remote wilderness. I would suggest perhaps buying the maps when planning your trip and looking online. A good site, if a little old, is here. There is very good information in English on all the points I have mentioned above but usefully pictures of many many Sarek tours. It's a question then of matching the map to the areas which categorise the pictures and getting an idea of conditions on the ground. Sarek's demanding, no doubt. It's the weather that can really dictate though how your trip pans out and that's down to luck. If you are a fit and healthy walker used to the Highlands then you shouldn't face too many surprises (that said Sarek is not a place for the novice, things can and do go wrong - I've included a picture of a young man below who went missing in nearby Padjelanta, I wondered whether it's the right thing to do - as a parent I can well understand his parents' loss - the point is please exercise care in these big spaces (more details here in Swedish in a poignant post on Utsidan)). Make sure you are well drilled in wet weather camping and your gear is freshly proofed. Vegetation can be more demanding to cross (I'm thinking of dwarf willow) and water courses can demand more care. Mosquitoes are an issue in Scandinavia but my experience of Sarek is that it's too high and well ventilated for them to be an issue. By mid-August they should be gone. You will need good enough gear and food to live comfortably for your trip. That said you can pick up supplies at huts either on Padjelantaleden or Kungsleden. There is nothing in Sarek unless you can turn your hand to fishing (not uncommon for Scandinavians). There's some enticing photography on the internet (a marked increase in English language sites over recent years). Worth visiting here and here (note no more packrafting in Sarek though, a ban has just come into force). For Swedish speakers 'Utsidan' is a good resource. Finally, don't forget that Sarek is not the last word in Sweden's expansive mountain chain (picture below is from Arjeplog Fjallen, I was entranced by them as I passed through this summer, they lie around 5 days walk to the south of Sarek), however, you'll be arguing with passion after a Sarek tour as to Sarek's place in any shakedown of the world's best hiking.